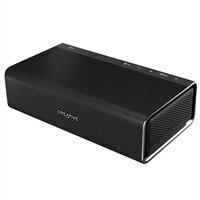 The Creative Sound Blaster Roar PRO is a powerful, feature-rich, 5-driver portable Bluetooth speaker. It comes with improved 5-driver system that is powered by two high-performance amplifiers. The Roar Pro is also made for professionals in their respective fields. It can be used to build up a wireless personal PA system (Public Address system) for presentations, conferences or even karaoke sessions.